Through prayer, dedicated service and Christian love, our choirs endeavor to bring joy and inspiration to the worship experience at New Hope. Using our God-given talents, we offer to Him our praise and thanksgiving through music. Adult choir sings each week for the 10:00 worship hour. This group shares diverse music from a variety of styles and periods. Previous choral experience is an asset but not required. High School students are welcome! Choir rehearses Wednesdays at 7:00 pm. Children ages 3 to 2nd grade sing once a month for worship. They learn to sing on pitch, respond to rhythms, listen, memorize songs and hymns, and sing with or play instrumental accompaniments… and more! Choir rehearses Sundays from 9 to 9:15 a.m. at which time the children are escorted to their nursery or elementary aged Sunday School class. Middle Schoolers through Retirees are welcome to come and chime in. Being able to read music is helpful, but not knowing how to read music is not a barrier to learning how to ring the chimes and join the choir. 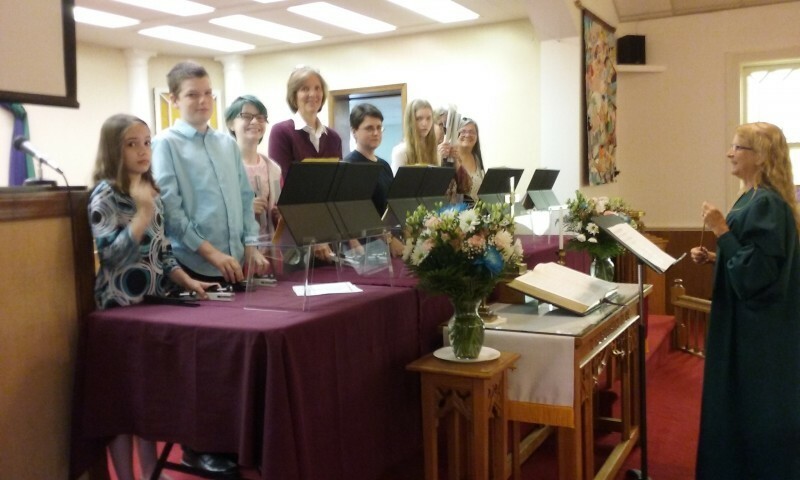 Choir rehearses on Wednesday evenings at 6 p.m. and play once a month during worship. All children, youth, and adults who play instruments are encouraged to offer their talents as they participate in worship and other programs. Whether one plays piano, guitar, handbells, or a wind, brass, or string instrument, we invite you to share your gifts with us.